By supporting the entire trading cycle, 1C: Trade management (1C: TM) automates the whole process: from analyzing the demand for goods and planning supplies up to shipping. Apart from that, based on the results of the accounting, 1C: Trade management makes it possible to form various kinds of reports for complex analysis of trading activities of an enterprise. This software solution includes the mechanism for client segmentation, analysis of customer base dynamics, automatic ABC/XYZ analysis. says Natalia Gurova, a leading consultant, «First BIT», Moscow, «Sportivnaya» office. 1C:Trade Management allows to carry out a complex automation of wholesale and retail enterprises due to the existence of 8 functional blocks. 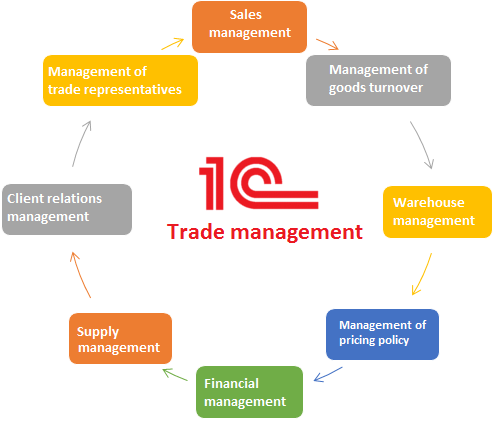 Apart from that, due to the possibility to unload different reports, 1C: Trade management will make it possible for a business to exercise control and perform analysis of target indicators of the company’s activities on the whole. 1C:Trade Management system reflects both completed and planned trade operations, which allows to automate execution of practically all the primary documentation of trade and warehouse accounting, and also cash flow documents. Want to learn more about the program or get a demo-version?